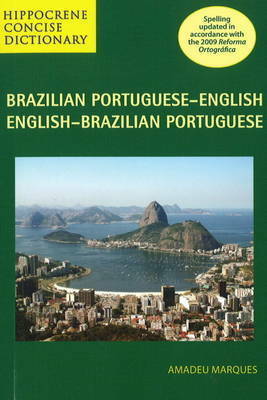 Brazilian Portuguese is written and spoken by over 180 million inhabitants of Brazil as well as by several million Brazilian em-igrants in other parts of the world, including over 1 million Brazilian Americans. Brazil is the most popular tourist destination in South America, enjoying over 5 million visitors in 2008. It is also the second largest economy in the Americas (after the United States) with thriving industries such as automobiles, steel, petrochemicals, aircraft and banking. Feature of the dictionary: Concise size with 10,000+ essential entries; Each entry includes key grammatical information and pronunciation; Many entries include related words and phrases; Spelling updated in full accordance with the Reforms Ortografica da Lingua Portuguesa, 2009; Perfect for businesspeople, travellers, and students. Amadeu Marques is an English and Portuguese teacher and author whose books have been published in Brazil for over thirty years. He lives in Rio de Janeiro, Brazil.